A backyard barbeque isn’t quite complete without hot dogs, sausage, kielbasa, or some other “dog” that you can grab and go! When it comes to toppings, you can go traditional or get creative. Check out these regional favorite topping combinations for inspiration. A skinless all-beef dog topped with mustard, sweet relish and chopped onions (plus a top-split bun, of course!). Kosher style dog topped with sauerkraut and mustard. 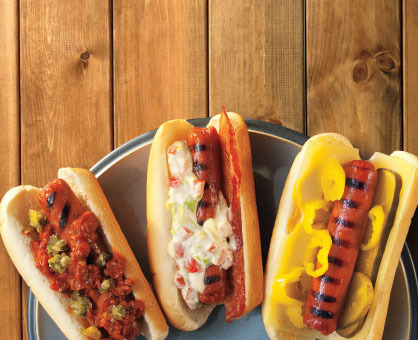 A slawdog topped with coleslaw, chopped onions, mustard and chili. A classic coney dog topped with chili, mustard, chopped onions and Cheddar cheese. Bacon-wrapped dog topped with pinto beans, jalapeños, onions, tomato, mustard and mayo.